We are so excited to share with you the fifth title from our popular coffee-table book series! In it, you’ll experience the magnificent work of one of the world’s most esteemed quilt artists. 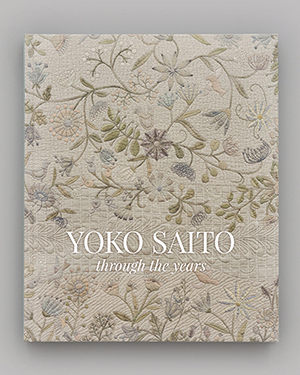 Yoko Saito through the Years is a retrospective of the distinguished career of Japanese master quilter Yoko Saito. Her history unfolds in dozens of spectacular photographs, revealing her astonishing patchwork and appliqué creations up close like never before. 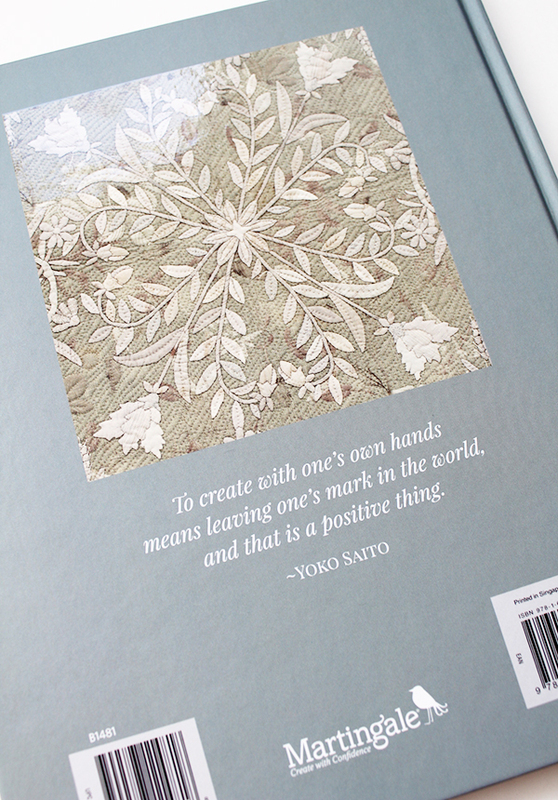 This keepsake hardcover volume spotlights snippets about Ms. Saito’s fascinating artistic journey, in her own words. 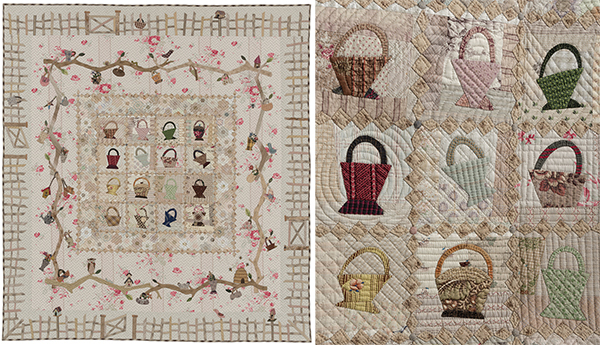 An in-depth look at Ms. Saito’s spectacular quilts and bags celebrates 40 years of her illustrious career. Each piece is featured in photography that reveals the tiny stitches, the subtle hues, and the surprising details that make her work a joy to study. Every page will take your breath away! Marvel at hundreds of fabrics, thousands of embroidery stitches, and Ms. Saito’s stunning appliqué—all sewn to perfection. Not sure what to get your best quilting buddy for Christmas? Want to surprise a creative soul you know with an indulgent gift? Need fresh gift ideas for the creative people in your life—or a special gift of inspiration just for you? Look no further. Yoko Saito through the Years will have you covered—from cover to cover! 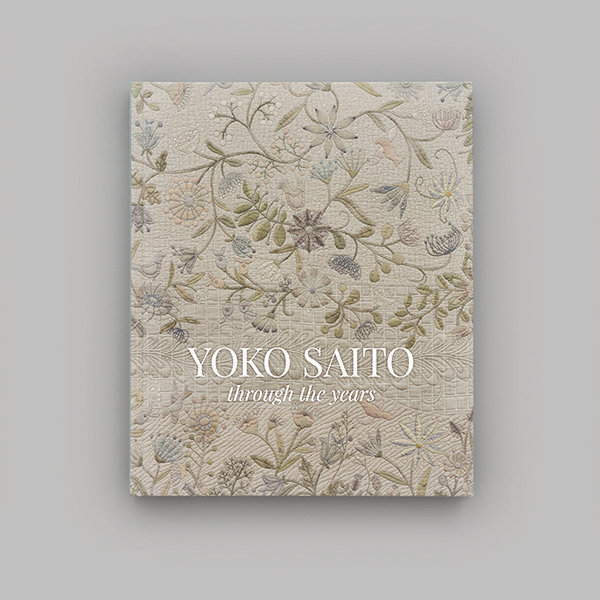 We have a copy of Yoko Saito through the Years to give away along with a beautiful collection of Yoko Saito Centenary fabrics from our friends at Lecien Fabrics! One winner will receive an Origami Square (10″ precut squares) and two Sushi Rolls (2½" precut strips). Lecien even included a beautiful embroidery pattern designed by Yoko Saito! Yoko Saito: fanatical fan, enthusiastic admirer, or new to her work? We’ll choose a random winner one week from today and let you know by email if you win. Good luck! And if you can’t wait to own a copy of Yoko Saito through the Years, you can order one today at our website, ShopMartingale. I Love her work and would be thrilled to win this!!! Thanks for this extra special giveaway. I am fairly new to Yoko Saito’s work. I have seen some of her books and love the designs. The colors are beautiful too. New to her work. It’s stunning. Have been a fan of Yoko Saito for years. Always buy her books and have tried some of her patterns. Her fabric is wonderful as well. An enthusiastic admirer and fan of her work, I try to incorporate some her work in my quilts. I always love seeing work done by others from a different country. Would love to have this for my coffee table. I am an enthusiastic admirer of her work. Spectacular book!I’ve admired Yoko Saito’s exquisite work for years. I am an enthusiastic admirer of Ms Saito’s work. I cannot imagine the amount of time and patience she puts into her quilts. I believe it would make a beautiful quilt or whatever project you choose. I have just recently been introduced to her work. It is beautiful. What a beautiful book. I’m an enthusiastic admirer of Yoko Saito and own several of her books. I’d love to win this! I love Yoko’s work – her style and use of fabric is amazing! This is one book I’m anxious to buy – as a birthday present to myself! I would have to say I am a huge admirer of Ms. Saito’s work. I am always inspired by the work of Ms. Saito. I love her use of taupes. I would dearly love to win a copy of Ms Saito’s book for far too many reasons to list here. Her work is beyond breathtaking. I’m an enthusiastic admirer. Beautiful work! I have been gathering fabrics to make the"houses block of the month quilt". I love the details and the elegance of the taupe fabrics. Yoko Saito’s color choices speak to my heart. This combined with her attention to detail and uses of botanicals in her pieces draws one in for a closer look, a feeling of calm. Winning a copy of this book would be amazing. I am new to Yoko Saito works. The patterns look challenging. Yoko Saito – fanatical admiree (?). She gives me so much inspiration with her creative, imaginative designs. Being a somewhat new to Yoko Saito does not make me any less a fan – her work is fascinating and inspiring!!! Would never come to the end of finding new and amazing details if I had time to study steadily for weeks and months – this book promises to be the most awesome yet – Thank you for the chance to win one, Martingale !!!!! This looks like a great book and fabric! Would love to win this for sure! I love all your books! I am an enthusiastic admirer of Yoko Saito’s work. Her intricate stitches are a joy to look at. I am new o her work but am anxious to explore it. Would be so excited to add her works to my quilt library. I collect this information to expand my knowledge on artists, styles and history of quilting. I have been quilting for over 50 years, taught by my grandmother when I was very young. I look forward to expanding my knowledge. I’m new to her work. I’m new to her work but now I am definitely a fan and an admirer! I’ve learned of her work only through your site. I am new to her work! Now I want to know more! Thanks for the giveaway! I am an enthusiastic admirer! Yoko Saito’s art is amazing. The quilt stitches are so tiny and her designs are gorgeous! I’ve learned of her work only through your site but love it. I am new, enthusiastic admirer, but I can see me becoming a fanatical fan very easily! Yoko Saito’s work is beautiful and amazing! Thanks for the chance to win! I am new to her work. Absolutely stunning and beautiful details! I’m definitely an enthusiastic admirer! Enthusiastic admirer! I have been a fan of Yoko Saito for a few years and have a couple of her books and a purse kit in my stash. I am always astonished at her work. The detail is incredible and so elegant with using the taupe color story. My birthday is this month! What a great birthday present this would be! Ms Saito is an inspiration! Her work is detailed, and lovely to look at. I am a enthusiastic admirer! Keep your books coming, please! Her talent is awe-inspiring. I have always admired her work and someday hope to make one of her quilts! The artistry of Yoko Saito is amazing! Her use of color and stitches is an inspiration to all those who embrace needlework. I would love to win a copy of this book and the accompanying Lecien fabric. Thank you for offering this to Martingale fans. I am new to her work and very excited to peruse her new book. The cover of the book is extraordinary. Excited to see the fabric as well. I am a very enthusiastic admirer! I’ve just recently discovered Yoko Saito’s amazing work. I am so anxious to learn more! This book would perfect to help me achieve that goal. I am new to her work. I love her quote about leaving a positive mark with handcrafted items. What interesting pieces and designs in her work. I would love to win this prize and create these beauties. I have admired Yoko’s work for several years now. I have been honored to see some of her quilts at a bigger quilt show. And lately have been intrigued watching short videos of her stitching. She has such beautiful, soft designs. Thank you for such an amazing giveaway. This book is to be treasured. What absolutely breathtaking work. She is new to me and I look forward to seeing and learning more about her and her techniques. Every day I wake up, I feel lucky to be alive. Another day to express my creativity. Yoko Saito: fanatical fan, enthusiastic admirer, or new to her work? All of the above! I am new to her work. I would love to win all the goodies. Her work is so very soothing to see. Love it! Hoping I am lucky enough to win! Your first mention of her in this blog last year was the first I’d heard of Ms. Saito’s work; I lived in Japan for a year, so I was fascinated. Now I’m considered a fanatic about her fiber art as I’ve shared information at our quilt guild, obtained books and tried techniques that I would never had considered if it hadn’t been for your mention of her. I am new to the work of Yoko Saito. The stitching is beautiful. LOVE, LOVE, LOVE ……Yoko Saito’s work! She is brilliant and I love her books! Fanatic I think! Her work is so soothing to see. Enthusiastic Admirer! Amazing workmanship that anyone would love to aspire to. New to her work -but it’s beautiful! New to her work – gorgeous!!! Yes I feel extreamely lucky. I am a FANATICAL FAN, Yoko’s work makes my heart sing. Yes I feel lucky and would love to win this prize, there is not a store near me that caries fabric like this. Very enthusiastic admirer. But not yet brave enough to try any of her patterns. I am a very enthusiastic admirer of her work. It is absolutely exquisite! I am an enthusiastic admirer of Yoko Saito’s craft. I have one of her pattern books and sometimes just enjoy sitting quietly and paging through it cover to cover. I’m am an enthusiastic admirer. Her work is breathtaking. I would be Very Lucky to win Yoko’s book. Her book looks beautiful. I am definitely an enthusiastic admirer. Her work is stunning. Definitely an admirer of her amazing work. Fanatical fan, I own all her books and have a whole collection of Japanese fabrics. I’ve admired Yoko Saito’s work for a long time. I love looking at it–I haven’t made anything specifically, but I like her colors. i am totally in awe of ms saito’s artistry and attention to detail. absolutely amazing! Fanatical Fan!!!! She is a beautiful soul who is gracious enough to share her talent with all of us. Fanatical fan! I own all he books and have a whole collection of Japanese fabrics. Yoko Satio Speaks to my very soul. I would love to own a copy of of this lovely book. I also have a treasured collection of Lecien fabric that I use in special projects. I would love to add those fabrics to my collection. Definitely an admirer of her amazing quilts! Just lovely soft coloration with such detail. She’s a master! I am a fan of her and her beautiful work. She is absolutely amazing! Would love to have a copy of Yoko Saito’s new coffee table book. Thank you. I am a very enthusiastic admirer of Yoko Sato! I have a couple of her books and look at them dreaming to make one of her beautiful creations! I am awed at her work. It gives me an inspiration to start a project of my own. I am an admirer of her work. I love doing handwork and can not believe all of the handwork that goes into each piece she does. I must admit that I am a fanatical fan of Yoko Saito. She is an amazing quilter. I can only strive to learn from her techniques to become a better quilter. Thanks for the opportunity. I’m an enthusiastic admirer of Yoko Saito. I could never begin to do the kind of work she does. Her purses are fabulous. I’m new to Yoko Saito’s work, but I am in love with it. It’s beautiful, so intricate and restful to the eyes. New to her work, its beautiful! Oh, I’m definitely a fanatical fan of Yoko Saito’s work! Her work is so beautiful! I would love to win this book! I haven’t heard of her before, but I see I’ve been missing out. I only recently learned of yoko’s work. I would love to have this prize package. Thank you for the opportunity! I had the opportunity to see Yoko at the Japanese International Quilt show. Her work is amazing. I have several of her books. OMG this would be awesome to win! Her stuff is gorgeous!!! Congrats to the lucky winner!! I’m a fanatical fan! I would love to make all her patterns. I LOVE her color palette! How special it would be to win such a great prize! Thanks for the opportunity & please tell Yoko to keep on designing! I am definitely an enthusiastic admirer. I have tried my hand a several different types of handwork but her items are “over the top”….so beautiful! I love to look at her work. Her choice of fabrics are amazing and I always wonder how she does it. I admire and love Yoko Saitos works. I already have several of her books and have made many of her beautiful bags. I am definitely an enthusiastic admirer of Yoko Saito’s. She is so extremely talented and her work is just beautiful. I love Yoko Saito’s work it’s so pretty to look at but tough enough to use. I love looking and wishing I could make items as good as hers, I can but dream. What can i say i have one of yoke’s books and have made several items from it they are so beautiful i long to own more of her books but they are so costly i can not afford them i prize the one i have and would love to have at least one more. I am new to her work. WOW! The details she sews are simply amazing! I am a fan and admirer of Yoko Saito. If I can be half as good as she is I will be happy. Her work is the most beautiful I’ve ever seen. BIG fan…her work is fantastic! I am a big fan. Money is tight and I am very fortunate that my library has or will get any of her books for me! Looks like I am the first to post so maybe that will make me lucky. The fabric is beautiful and the book looks to be inspirational. Such an admirer of Yoko Saito. Only have a couple her books on Sashiko quilting, and this new book looks amazing. I have admired her work for years and enjoyed seeing her winning quilts on the internet. I love her work, so calm. Time to start a new fabric, book,and pattern collection! I accidentally ran across her on youtube. I fell in love with her method immediately. I especially love her purses. Her handwork and choice of colors is what fascinates me. I am trying to emulate. Having anything from her would be a dream come true. I have been an admirer for a long time. I would love to win a copy of her book! I have been a long time fanatical fan and enthusiastic admirer of Ms. Saito’s work. I would luv to win this prize package. Thank you! Enthusiastic admirer! Never made anything like this but I would love to try. I don’t consider myself that lucky, but I do feel blessed! Ms Satio’s work does simply takes your breath away. Her hand work and vision is exceptional and her choices of color and attention to detail soothes the soul. She is and has such gifts to share. Enthusiastic admirer. She is just a wonder to me. What talent. This book looks so beautiful. Thank you for the chance to win a copy. Love this fabric and hoping to win! I have been a long time fanatical fan and enthusiastic admirer of Ms. Saito’s work. She is truly amazing. Thank you for this chance to win this awesome prize package. Her work is astounding, I’m so glad you keep me updated with her newest releases. I love her work, it’s so different from anybody else’s. Would love to own her newest book. Enthusiastic admirer… sew hoping to become a fanatical fan! What a beautiful looking book, even though I’m not good enough to make anything like these works of art, it would just gladden my heart to look at her creations. New to Yokozuna’s work but very interested in it. Quilting is such an exciting hobby. We pull ideas from other quilters and reinterpret it to be our own. Those fortunate to receive a quilt should readily be able to see the artist’s heart. I am fairly new to Yoko Saito’s work, but quickly becoming and enthusiastic admirer! I am feeling lucky! I saw a sampling of Ms. Saito’s work at quilt market in Pittsburgh one year and was bowled over by care and detail to her village scenes. I bought a pattern book of hers at the show I just love looking at it. Gorgeous work that had inspired 25 year old me to want to be a master quilter myself some day. I’m a fanatical fan of Yoko Saito. Am in awe of this gifted artist. Have several of her books; and, would dearly love this one. How wonderful to know that there is another one available. Thank you for this lovely giveaway opportunity. I have all of her books and some patterns I have found along with a drawer full of her wonderful taupes – I need to make it a priority to make my favorites. Thanks for publishing this book. Yoko’s work is absolutely amazing. I’m a new fan! I have several of her books. Her handbag designs are truly works of art. She does the most fascinating things with fabric. I am a new fan. Stunning quilts! New to her work but it look amazing would love to win this. FANATICAL fan!!! I was fortunate to meet Master Quilter Saito last year. She is one of the most lovely, kind, and talented people I have ever met! This book looks breathtaking! Yes!!!!!! Thank you for this giveaway! This book looks aMAZing! I adore Yoko’s work. New to her beautiful work. I am new to her work. New to her work, her beautiful work. Ms. Saito’s work is just Stunning. She is so inspiring. An evening to learn the techniques used, but a lifetime to master. New to enjoying her work! Since seeing her work in person in Houston one year, I’ve been an enthusiastic admirer of her work! I haven’t had the courage to make anything yet, but this could do the trick. I am an enthusiastic admirer of Yoko Saito. I have several of her books, in English. Thank you for the chance to win this new one. Love the purse and fabrics and would be honored to be the winner. Definitely an admirer of her work. It leaves me in awe! Enthusiastic admirer. I love seeing her work in person. I am an enthusiastic admirer! I love the colors in her work. would feel blessed to win this beautiful book. Her work just astounds me! I’m an enthusiastic admirer. Discovered her work this year and absolutely in love with it. Love the colors that are used and love the designs. Something I love looking at. in Japanese. She has made two purses from this book, and just by looking at the pictures she could figure it out. Well So, because of my friend, I’m a enthusiastic follower. I would be so grateful to receive this beautiful book. I’ve always admired Yoko’s work. It’s so distinctive! I would love to win this prize. I’m new to her work and really admire what I’ve seen in this posting! Thanks for a chance to win! Such infinite patience and teeny precision that it boggles the mind. This one will be so cherished by whomever is lucky enough to win this one. I’m a new fan. This book looks gorgeous! I have followed Yoko’s work for many years, she is just amazing! I am a very enthusiastic admirer of the subtle beauty of Yoko Saito’s style. I’ve never made any of her projects, but am awed by the intricacy and subtlety of her work. What a stunning gift that book would be. I have never used her patterns although I’m aware of her . So I am a newbi. I would love to try her fabric and patterns. They look wonderful! I’m new to Yoko Saito’s work. I can’t believe how beautiful all of Yoko’s work is. I love that her work seems to be infuenced by nature and I dream that someday my work will reach the level that she has achieved. I live in an isolated community where nature is my inspiration and my love. Thank you for the opportunity to win this beautiful gift! I am new to her work, very pretty! Well it only happens once in a while but yes, I’m feeling lucky and I love, love, love Yoko’s work! Maybe my number will come up this time!!! Oh I would like be to be the lucky person to win this amazing gift set. Her work is so intricate and beautiful. I saw Yoko Saito’s work at the Houston International Quilt Show in 2017. Oh my, what a joy to see first hand. I became even more fascinated at her work. I even got to meet her at the Martingale venue. Lovely! I’m inspired just looking at the add. sitting in an airport wishing I had needle and thread. Love doing hand work and different techniques. Looks like a challenge for me. I would say I’m a fanatical fan of her work as I have stood and stared at it trying to take in every detail. It took a few years before I realized it was the work of one person that always caught my attention. i would like to be entered into the yoko saito book and fabric giveaway. Her work is absolutely glorious!!! Enthusiastic admirer, book already ordered and hopefully shipped. Would love to own this book. just to dream about. Enthusiastic admirer–because I subscribe to Martingale newsletters! Yoko Saito’s work is astonishing and wonderful! Thanks for the giveaway! I am a fanatical fan and a enthusiastic admirer. I love her work! I am new to Yoko’s work. What magnificent detail! I am so new to her work, I still have the new car smell. Everything is so beautiful! Yoko is new to me. Such lovely work. Fairly new to her work, but your description is apt — these are breathtaking! Wow, such beautiful quilts. Yoko Saito is new to me. I am an enthusiastic admirer as Yoko’s work is awe inspiring and beautiful! Her work is new to me – just what I have seen on this website – but am quickly becoming a fan. I love her color schemes and choice of fabrics. I have been admiring the work of Yoko Saito for quite a while. She does such exquisite work. An unique artist. I would love to have her book. I am an enthusiastic admirer and have 2 of her previous books. Her work is unique and you can recognize it from anywhere. I am quickly turning into a fanatical fan. I have admired Yoko Saito’s work for many years since I first saw it in a quilt magazine ad. The elegance of her handwork and choice of colors is outstanding. I don’t believe in luck so maybe that is why I very seldom enter free drawings. This is one I would certainly appreciate winning. Thank you for having the opportunity. Fanatical Fan! I am in awe of her work. I plan to make a quilt of all the important homes in my life in her style. I am feeling lucky! I love her projects and would be excited to try! Yoko’s work is absolutely amazing! I would love to have her book and the opportunity to win the fabric also. Does three books count as fanatical? I am in awe of her work and wish I had the time, patience and wherewithal to go learn from her. Amazing design work and technique – it’s on my bucket list. This book is so gorgeous and inspiring.The color and workmanship is awesome. I thought I would be lot for a long time going thru it. I would then pass it on to my friend who is half Japanese and loves handwork. Please pick me, it will end up being shared by two ladies who love threads, fabric and sewing. Yoko Saito’s quilts are just awesome. I would love to own this book showcasing so many of her beautiful quilts! I’m fairly new to Yoko’s work but I love and admire it. I am an interested admirer. Her work is beautiful! She uses a lot of low contrast and I tend to be the opposite. Would love to give her style a try! Her work is so beautiful. I love the detail. Thanks to the Martingale Blog I have been introduced to Yoko’s amazing work. I would love to be entered into the drawing. This is one time I would truly love to be lucky or more appropriately, blessed. I am a very enthusiastic admirer of Yoko Saito’s work. I would love to win this prize and am grateful for the chance. New to Yoko’s beautiful work. 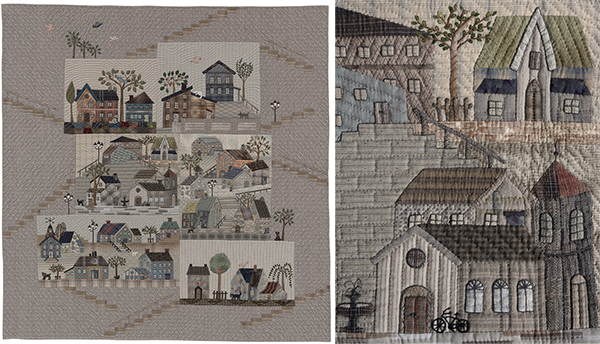 Enthusiastic admirer – that Mystery quilt with the houses is on my all-time bucket list! Her work is beautiful and inspiring! I would love to be the winner! Many blessings to you!!! I’m a huge fan of Yoko Saito ….. I love all his work …. his colors …. his drawings. I love her !! I would love to own this beautiful book. Her work is truly awe inspiring! O my goodness! Have only recently learned of her work! Everything I have seen is so beautiful! Will keep my fingers crossed for this prize! I wood love to win! 69 years old and very seldom a winner. Help me break this record, please! I have always admired Ms. Saito’s work & have many of her books. I find her work to be inspirational as I create my own fabric art projects. I love the detailed appliqué & beautiful handwork! This new book is wonderful & a "must have" for me. I am new to her work and I find it fascinating! Yoko’s workmanship is unique. I am new to Yoko’s work, which is absolutely stunning. What a treasure!! Love her books, her calming, warm fabrics. She has inspired me to make several “neutral” quilts. Her style of applique is amazing, love the houses, nature & children! I’m sure this book will be a must have. Completely awestruck, I am new to her work. Beautiful! I love her work. I am both a fanatical fan and enthusiastic admirer. I have been so lucky to meet her, and was star-struck for months! Last year at Festival I stopped by her booth and mentioned how much I would love a coffee table book of her work, no patterns, just all her work, and she told me one was coming and would be available this year. That is my splurge–I’ll be teaching at Festival again and hope to go by her booth and get an autographed coffee! So different from my work and so inspiring and beautiful! Fanatical Fan! I have loved looking at her projects over the years and believe she is a truly gifted artist! Her work is just stunning. I have been admiring it for quite a while. She works in colors that are so different from the ones that I use and I definitely appreciate what she does!! I’m completely new to her work…it’s amazing! definitely a fan she never ceases to amaze and inspire. I’ve been an admirer of her work for a while. It’s amazing. Absolutely beautiful! Such detail! Would be grateful to win. I’m such an enthusiastic fan of Yoko Saito! Her art work is truely stunning, and I’m in awe! Thank you, Lecien and Martingale, for this beautiful giveaway! I love her color and design choices. She’s an amazing quilt maker. This is a beautiful book. Yoko’s work is like a painting. She is truly an artist. I recently discovered Yoko Saito and absolutely enjoy her work. Her use of neutral fabrics, texture and stitches inspire me to stretch my own boundaries. I love her books and have several. So far I haven’t found the courage to start one of her patterns. Would love to have a coffee table book featuring her exquisite work. A fan, a definite fan. Stand marveling her work as almost unbelievable. She’s on my bucket list – to make one of her patterns for sure. I am new to Yoko Saito’s work. Her attention to detail is amazing. I have several of her books. Love her work. I love Yoko Saito’s work and have four of her books so far. I have tried small projects and would love to try something larger next year since this year is full with other projects and volunteering. She is truly an inspiration to me and I would be so grateful if I win her book. 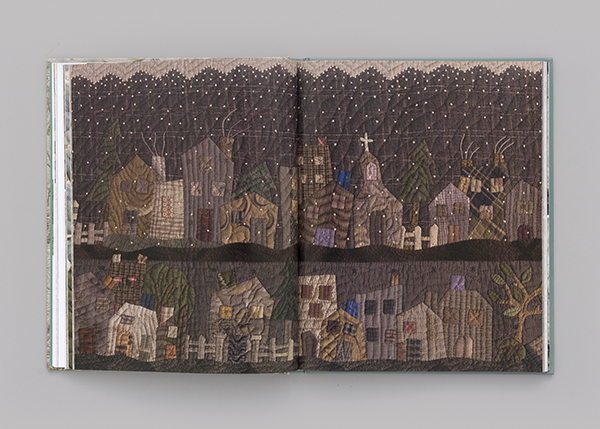 Yoko Saito is SUCH a gifted quilt artist – I LOVE looking through her projects, have several books of hers. There seems to be no end to her quilting talents!!! She has such detail in embroidery and applique and quilting. LOVE LOVE her work!! Thanks for option to maybe win this book – awesome giveaway!! Her work is absolutely beautiful!! It inspires the creativity in me and I would love to win this giveaway! What a special book to have for browsing for ideas and enthusiasm!! This book is awesome. I’m a fan! One talented lady. I have long admired the work of Yolo Saito. Such amazing detail and beauty in her quilts and more. Enthusiastic Admirer! Her work is absolutely stunning. Many of the quilts I make include applique as I find handwork so meditative and relaxing. This book looks to be one that you’d never tire of opening up time and time again and admiring every little detail. I have admired her work for several years and just recently bought some of her fabric for a tote. It would be inspirational to have her book. I am new to her work. Pictures look beautiful! I am an enthusiastic admirer. Her work is just beautiful! I have admired her work for several years. I recently purchased her fabric for a purse. The book would be inspirational. I saw Yoko Saito’s work on the Martingale blog a while back. The nostalgic colours and themes are very enticing. I am an enthusiastic fan of Yoko Saito’,s work…it is gorgeous and exquisite! Yes! Im feeling very lucky 🙂 I love Yoko Saito’s work. I have two of her books and would love to have this package! I collect Daiwabo fabrics, too and I’ve even made a couple of her projects. Thank you! New to her work. Such beauty! Ever since I was introduced to her work, I have been in awe of her masterpieces! This book looks like a fitting tribute to her brilliance with needle & thread. Oh I have to say I’m a fanatical fan of Yoko’s. I am totally a fan of Yoko Saito and would LOVE to add this beautiful book to my collection! Hope I am the lucky winner!! Have been a fan for several years and admire her work!! This book would be a great one to win! Thank you. I have admired and been in awe of Yoko’s work forever. She patience and skill together produce beautiful, restful art. I would looooovvvveee to win her book!!! I have been an avid admirer of Yoko Saito’s designs and projects for several years. I have collected most of her books and find her delicate balance of color within her designs is perfect. To own one of Ms. Saito’s books and revisit her projects is a true joy. I learn something new about her technique each time I review her beautiful designs. Thank you, Ms. Saito! Love her detailed workmanship, I would love to be able to make one of her patterns. The choice of fabrics and colour are stunning! I am an enthusiastic admirer. 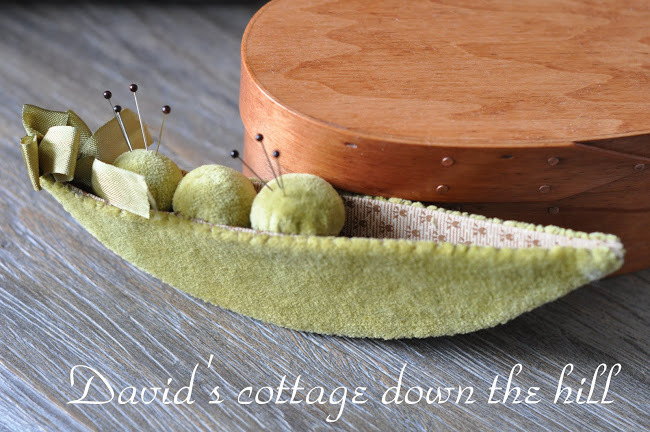 Her workmanship is so beautiful and I admire how she uses her muted colour scheme with such elegance. Enthusiastic Admirer, so excited about the new book!!! I am a total fanatic for her patterns. I especially love any with houses and her totes are really beautiful and I would love to win this book. I have a few but this one looks really amazing and can’t wait for the next one!! Fanatical Fan For Sure. I first discovered Yoko Saito in 2004. I’ve bought several of her books and taken others out of the library repeatedly. Love everything she does. In fact, this inspires me to get out her Japanese Color Theory book and read it again. I would love to add this book and the wonderful fabrics to my collection. Just started my first Yoko saito project and love it. Love Yoko Saito’s amazing fiber art work! I have admired her work for years. I have a friend that has made some of her patterns and love the results. This book will be shared with several people. Definitely I am a fanatical fan of Yoko Saito! Her exquisite handiwork is an inspiration to me. 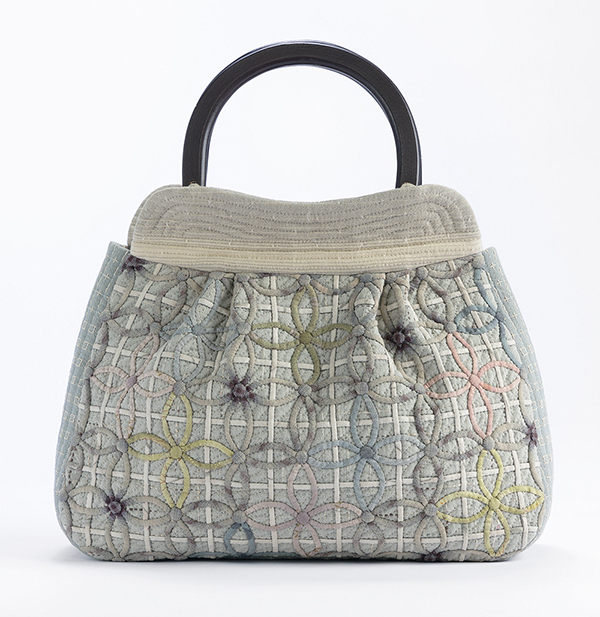 The quiet of her taupe fabric is the perfect complement when she chooses to incorporate colors into her creations. Watching her hand-quilt in a video clip recently made me want to improve my quilting stitches – which is ultimately the goal of any perfectionist! Definitely an enthusiastic fan. A friend of mine has made several of her projects and they are inspiring. I am new to her work. Just gorgeous! I am new to her work and it certainly is beautiful. I have NEVER won anything and yet, I feel this may be my lucky day. I have followed her designs and am quite a fan. Her work is fabulous and her technique also. It would be fun to introduce it to my Monday morning sewing/quilting group. Not familiar with this author. Work looks lovely! I am so glad that you are publishing this book. I have long been an enthusiastic admirer. I am an admirer of her work. I am an enthustiastic fan ! Love her work. I have done a couple of blocks of the Mistery Quilt with the houses and bought a book with bag patterns that ‘ someday ‘I will try to do. Thank you for giving the opportunity to win this giveaway! I love Yoko’s work. She is an amazing artist. I especially love all her different houses 🏘. I am an admirer of Yoko’s work. Such perfection and beauty. I am new to her work but it is unbelievably beautiful! She is amazing! I am a fanatical fan!! Ms. Sato’s work is incredible. I would love to have this book. Enthusiastic admirer. Her work is beautiful, as is this book. Enthusiastic admirer for sure. Not yet brave enough to tackle her designs myself. Yoko’s work is so inspiring. Thank you for this wonderful giveaway. Whoever wins will love it! Enthusiastic fan. Her work is amazing. Love her work and doing her house mystery quilt right now. I am an enthusiastic admirer. I love her work and am in awe of the beautiful stitching. I have been working on "Vases of Flowers" for awhile now. I have 2 borders to complete and then the quilting. Seeing her new work and fabric inspires me to keep working. I am feeling lucky! Would love to win this! I feel that Yoko Saito is one of the finest hand work artists there is! I’m a very enthusiastic admirer, but prefer to look at pictures rather than attempt her designs myself. Oh I would love to win this book!!! A huge fan although I know I will never have that color sense that she embodies. Love her work, it is so inventive and original. I look forward to learning more about this talented quilt artist. I have a couple of her books and love the look of all her projects, especially those in taupe. I am a fanatical fan! I’ve purchased her books in French ……. and I DON’T even speak French! I am new to her work. Such beautiful stitches! I would love to see her work in person. The only thing better than beautiful fabric is a beautiful book. Pickmepickme!!! Thanks. She is absolutely amazing. I have several of her books and thank you for this opportunity. I am an enthusiastic admirer of her work. I find it absolutely amazing. I don’t know how one person could produce so many beautiful and detailed pieces of fabric art. Her expertise and creativity are far beyond me but I hope to visit her shop while on a trip to Japan. New to her work. Wow! So admire her work and enjoy her books!!! I love Yoko’s amazing attention to detail. Her patterns are easy to follow, if a little daunting in their execution. I have completed a couple and loved every stitch. This book looks as if it is a truly amazing tribute to a super talented lady. Enthusiastic Admirer….feeling lucky too. Would share the book with quilting friends. I am new to her work . I see a calmness in her creations that. I very much need in my life . I travel with my partner when I am able and Yoko’s work would be so easy to take along. What an amazing woman she seems to be ……… a true treasure in the sewing world . Thank you for the giveaway opportunity . Love the details —I am an enthusiastic admirer. Working on Sashiko now. Enthusiastic admirer. This book has such lovely photos. It would be so much fun to add to any collection. Looks like a gorgeous book! And I ADORE Lecien fabrics! Beautiful book full of inspiration to keep on stitching. I’m definitely an enthusiastic admirer. I love to study her exquisite workmanship and beautiful designs for inspiration. This looks like a "must-have" book! New to this work! Love it! I am totally a fanatical fan. Ms Sato’s quilts appeal to my heart. Her subtle use of color is beyond magical. I would love to have this book since I doubt I will have the opportunity to see her work in person. Thank you Martingale for honoring such an amazing talent. She does such beautiful work. I love all she does. Enthusiastic admirer is my moniker. I’m in awe of what she creates and wonder what runs through her mind 24/7. She is extremely creative. Far beyond my capabilities. I absolutely love Yoko’s work. They color choices she uses in her quilts and workmanship is outstanding. I have almost all of Yoko’s books she has put out. This new book looks spectacular and I would love to add it to the rest of my collection of Yoko ‘s books that’s been published. I am new to her work. It is beautiful! I am an enthusiastic admirer close on the heels of a fanatical fan. I have three of her books, and each is as beautiful as the one before. She is truly a genius. Her work and her color choice is simply stunning. Yoko’s quilting is more like art work. After watching a video of her doing it, I think with "a lot" of work it would be achievable for others. I would be honored to have a copy of her book. I look with awe at her patterns but have never really looked closely at her work, believing that it is way beyond my capabilities. Just looking at the pictures on your website, perhaps taken one step at a time they would be something I could do. Her work is super spectacular! I love Yoko Saito’s work, I am very much a fan, would love to have a go but feel intimidated by it, it’s all just so beautiful. Thank you for the chance. Such a beautiful book. Her work is amazing. I would love to be the lucky winner. Definitely an enthusiastic admirer. Have just bought one of her embroidery/applique patterns and hope I am up to the task. I wish I had the skill to recreate some of the projects that I drool over when spending time at the bookstore. Do I feel lucky? No, not really because I seldom win anything…that being said I would love to bring this book home! My quilts have always tended to be colorful…brightly so. In the last several years though my color preferences have seemed to undergo a significant change. I am drawn to less contrast, and am making softer color choices. I credit Yoko Saito’s work for encouraging me to appreciate softer palettes. Thank you for this opportunity to call this book "mine"! Fanatical fan!!!! I love her work! What a beautiful book. Beautiful work!! I would love win her book. I absolutely love hand work and applique. I have to say that I am an enthusiastic admirer of Yoko’s. I would love to own that book and get to know her better through the pages. I also love her choice of muted colors. Very soothing. I am unfamiliar with her work, but can see that it is exquisite! I’m somewhere between the fan and the admirer, as I think I might be missing a book or two, but just drool over the pages of the books I do own. I would love to be the winner of this great giveaway, her works are fantastic! Yoko Saito’s colors are so soft and soothing. I just love her work! I have several of her books. Love her designs and subtle colors. Hope I win! I am new to her work. It is beautiful. Absolutely love Yoko’s work. This book is awesome! admire her work, could sit and watch her stitch for hours. Not familiar with her work but absolutely love it. I will become more familiar now. I’m a fairly new fan of Yoko Saito. Her work is absolutely beautiful! Thanks for the opportunity to win her latest book. Yoko Saito has the most imaginative way of using muted colors and Patterns of every size and shape. I am looking forward to seeing and reading her new books. She inspires us all. New to her work. The book looks lovely and I would enjoy learning more about her. New to her work. Very beautiful. I have followed Yoko Saito’s work for years and enjoy the books. I think the fabric is important in her final product and I just haven’t been able to find any. It would be especially wonderful to win the fabric. New to her work, and amazed at it! Not new to her work, but the more I see the more I appreciate. I would be so thrilled to win this book and fabric. Yoko’s work is so inspiring! I’m definitely an enthusiastic admirer. I admire her beautiful stitchery. Wish I could do that. Her works are so delicate. I am a fanatical fan of her work. Have several of her books. Her workmanship is beyond belief. 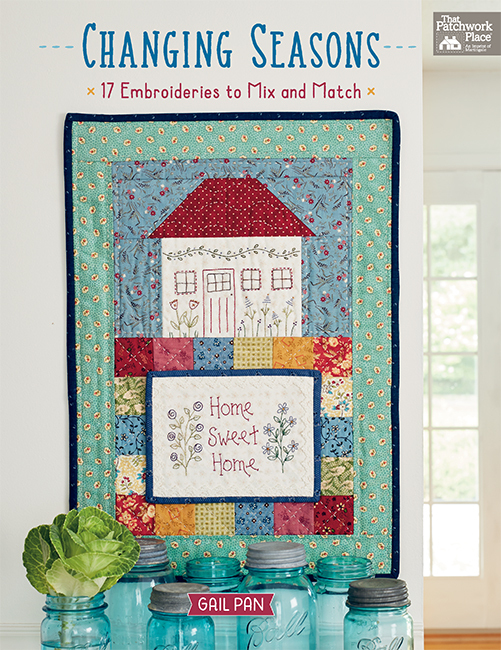 I admire Yoko’s prolific quilting and would love to win the book and fabric! I have loved her work for a long time. I am an admirer of all that Yoko Saito has done. She amazes me with her gorgeous designs and stitching ability. I am in awe of her beautiful handwork! Love everything she creates!!!! I am a superfan! Love the pieces she makes and I am in awe of her techniques. Beautiful work!! I would love to win. New to Yoko Saito’s work but an enthusiastic admirer already. Pure delight. I have admired her beautiful work for several years. Her designs and fabrics are delicate and peaceful. I could spend hours looking at the details! Looking at her work it seems so much easier than deciding on a many-choice of fabrics and colors. I can tell the learning process will be (I am so believing I will win the book!) much harder in the beginning because she uses multiple shades of neutrals. Not a common choice for me. I can’t wait to learn. I have drooled over the one book in the Faulkner County Library several times. I have heard of Yoko Saito but she is not someone that I am really familiar with. What I have seen of her work is very pretty though. I’m an enthusiastic admirer and great fan of Yoko Saito’s work. It’s stunning! I have loved Yoko Saito’s patterns and books ever since her designs have been available in the U.S. I love the gentle palette of color. I guess I must be feeling lucky to enter. Beautiful work. Would love to win the book. I’m new to her work, but what amazing work! I love the intricate details! I would love to own this book huge fan. Definitely an enthusiastic fan. Looking at her work, immediately takes you to another world, lowers blood pressure too. Beautiful book. I am somewhere in between fanatical and enthusiastic. We saw Yoko Saito’s exhibit at the Houston Quilt Festival last fall. She does absolutely stunning work. I have many of her books. She truly is a visionary artist who blends traditional with a modern flair. Her workmanship is exceptional. I love love love the lattice around the borders of some of her work. Thank you for the pictorial of her quilts, bags, and sundries. I am an enthusiastic admirer with us slowly working on her Vases of Flowers quilt. Thanks for the opportunity to win. I have admired her work for years. I love to do handwork. Enthusiastic admirer. Love her work! And books 😁. Thanks for the chance. I’m definitely an enthusiastic admirer of Yoko Saito! Thanks for a chance to win! I have been a fan for years! Her work is so beautiful, and easily recognized. I could look at her work for hours and still have to tear myself away. And the fabric she uses is gorgeous also. New to her work which is beautiful. The textures, style and colors are amazing! I’m definitely a fanatical fan! I wish these beautiful fabrics were more available where I live! New to her work but it is absolutely stunning! I am new to her work and I am in awe! new to her work – looks interesting! Her attention to detail and unique view of the world is fascinating! I love her work on handbags! I would love to win her book. Even with a lat quilt, her fabric choices and embellishments make her work 3 dimensional. Yoko Saito’s work is simply beautiful! I have one of her books and I *will* make something from it some day. In the meantime, I enjoy marveling at her artistry. New to her work. It is remarkable! I once met Yoko at the Tokyo Quilt Show ,She was selling her lovely books .Im currently working on the design featured in this latest book .Its on the cover . Im making a queen sized bedspread for my bedroom .Its all in Greys on a grey striped background & im just starting to hand quilt it ready for the quilt show in May in Perth West Australia .I hope I win!!!!! Her work is fantastic and so inspiring. I have done only a little hand work but would love to do more over the winter. I love her fabric choices. I have some of her books as well as patterns and they are truly works of art. I’m an enthusiastic admirer of Yoko Saito. Such a very talented creative artist. She has a special knack for combining great colors into such gorgeous creations!! I’m an admirer. I haven’t tried her techniques yet. Oh, yes – I’m a fan of the flowers, houses, & very neat purses. I’m brand new to her work. It is quite lovely! Oh my! I am not familiar with this artist, Yoko Saito, but her work is exquisite! I would love to learn more about her and her creations. Yoko Saito–what amazing design and quilting. Her work just stops me in my tracks! Total admiration for her handwork, design and details. I have many of her books and some of her fabrics. Saw her exhibit in Houston last year – stunning to see so many of her pieces "in the cloth". I am an enthusiastic admirer of her work!! Her work is amazing in detail and color choices. I would say I’m an enthusiastic admirer of her work. I would love to have this book to pick up be inspired by her talent! I am excited to learn more about this beautiful work. I am new to her work but her ideas are very inspirational and I would like to attempt. I’ve admired her work for years! Someday I’m going to make one of her quilts! Don’t know how lucky I am but I love this delicate work. A long time admirer. Her work is fascinating, her ideas are so creative, and her work is impeccable!!! Yoko Saito’s works have peaked my interest although I’ve been late getting onboard with low contrast and such a soft pallet. Her designs are full of minute detail so that each time I view her pieces, I discover something new. I have followed Yoko Saitos career and quilts for years. If ever there was a book I’d love to win or if not, buy, it is this one. She is amazing. Her work is so very beautiful. I am definitely an enthusiastic admirer! An awesome artist, so talented. I love her designs. I’d love t win but if not, buy, this book. I’ve been a fan for years. I admire the subtle use of color, of intense detail in her work! I’m new to Yoko Saito’s work; it is beautiful! I hope I win the book and fabric! I’m an enthusiastic admirer of both her beautiful quilts and inspiring books. I love her subtle use of color. Love Yoko’s work. Absolutely beautiful!!! I am an enthusiastic fan of her work. I have been seeing her work for the past year and in awe of her hand work. I love doing handwork but don’t think I could ever come close to her level of achievement. Just beautiful, breathtaking designs. Fascinating designs and work. I would to make some. On love the hours, but the picture of the vase with flowers is amazing. Love her work. Enthusiastic admirer . . . I have lots of her books and have begun to collect fabrics and play with the hand sewing techniques! I have always loved the intricacy of her hand work and the detail. I have always liked the soft colors that she has used in her projects. New to her and her work. Fanatical fan! Thanks for a chance to win! Yoko Saito: new to her work! I am an enthusiastic admirer of her work. I find it remarkable and fascinating. I love the colors she uses and I would be thrilled to win this book! I am an enthusiastic fan of Yoko’s work – I look and look and see more and more. I’m always stunned by the beauty she creates! Lovely book and thank you for the chance to win! Her work is exquisite, thank you for a chance to win one. It amazes me when I see Yoko Saito’s work, how delicate and detailed it is. Her use of taupes is soothing as I study her precise piecing and quilting. She is a master of the art of quilting. I have been an enthusiastic admirer since I first saw Yoko Saito’s creations on a Martingale post, it was a case of love at first sight! I love the tradition, expertise, respect, and care that she puts into each item. ありがとう Yoko Saito! Thank you Martingale! I am new to her work. It is lovely! I think I have passed enthusiastic admirer and am on the way to fanatical! Her work is really amazing. I am new to Yoko’s work. It is absolutely beautiful. I’m totally in awe!!!!! Aware of her work. I am a great fan of applique work and to have a book by a master would be wonderful. I truly enjoy her work and am in AWE !!! She is so inspiring. I have recently started on one of her patterns. It’s the one of all the houses. I Love it !!! I’m Yoko Saito’s enthusiastic admirer, and already have 3 of her books. She is a genius! This is my first introduction to Yoko Saito’s work but I am an instant fan. I am an enthusiastic admirer and would be thrilled to win her book. I am amazed by what she does. I would love her new book! I am an enthusiastic admirer and love her workmanship! I guess I am an enthusiastic admirer of her work. It is stunning! It’s so tiny & I love the neutral shades of taupes, etc that she uses. Her work is aweinspiring! I’m an enthusiastic admirer and would love to win this giveaway. Thank you for the opportunity. I am a newcomer to her work but my best friend is a huge fan….thanks for the chance to win. i would give it to Helen as a Christmas gift…she would just love it. I am an enthusiastic admirer of her work. I have several pattern books, but have not tried any yet. I think I am intimidated! Her fabric choices are wonderful; and her applique and embroidery are perfection. I am feeling lucky. Yoko’s work is outstanding and totally gorgeous! The book looks wonderful and I will be lucky to win it or buy it! New to her work. It’s beautiful! New to her work, it looks beautiful and inspiring! I am new to her work, and I’m surely admire her work. Fanatical fan; her work is very inspiring. I am a fanatical fan. How does Ms. Saito complete so many exquisite pieces. Such beauty to behold. I am new to her work and think it is amazingly beautiful. Would love to be able to do that type of work. I’m a huge fan of Yoko Saito and greatly admire her work. I’m excited for her new book. Thanks. I am very much an enthusiastic admirer (due only to financial restraints). I love her asethic values, her often earthy palette, and her eye for design. The Quilt Party website is fun to ‘trawl’ through and I have snagged some wonderful fabric pieces there. I am hoping to accumulate enough to sew a quilt and a few bags I think. This book is a marvellous summation of her career, a book which would mean much to me to own. Thank you for this chance . I find her work so soothing and beautiful. It is different from anything I have done. The book is beautiful and I am increasingly wanting to try it out. Admirer for sure. Her work is beautiful. Hands down – fanatical fan! This style is so original. It has a calming effect for me. Enthusiastic admirer. Her work is beautiful and inspiring! The work is very beautiful. I’d like to learn this. I admired her work for a long time,as I live in Australia,being on the old age pension the price of the book is out of my price range. I love her work and find it very inspiring. I really enjoy the work of this artist, I quess you could call me a fanatical fan. I would love to own this book! I am in awe of her work. I wish I could get all of her books, but I am on a fixed income. I’m new to her work! I have always admired her detailed artistry and handwork. Feeling Lucky! Love her work. Enthusiastic admirer. I love her work! I have a couple of her books, and enjoy her wonderful quilting. I love the way that Yoko uses the beauty of neutrals to tell her fibre stories. I’ve been a fan for years. I just love all types of embroidery. I still have my yellow and green apron which I made in primary school. I am very proud of it. I must say my embroidery skills have improved greatly since then – nearly 60 years ago. I would love to get some new ideas from Yoko’s new book. My skills are not up to her mark YET. I am totally new to Yoko Saito’s work, but I am absolutely blown away! She is very, very talented. Thanks! I have been a fan of Yoko Saito for some time. I love her designs, fabric choices and the muted colors. I’d be honored to have this book on my coffee table. Her work is always inspiring and completely stunning. Her use of muted colors enthralls me. I have admired her work for some time but haven’t had the opportunity to try her techniques. I would love to win this fabulous giveaway! I have most of Yoko Saito’s books released in English. They (and she) are so inspiring I hope I win this one to add to my collection. Someone is going to be very happy to win! Not believing in LUCK, I feel chosen to win. Thank you for this chance to win. Her work is stunning and looks very challenging. Would like to try any of her patterns. I’m new to her work and a fanatical fan! I hope I win! I would really love to own this book. I have been a huge admirer of hers for years! I’m a huge fan and am in complete awe of the volume of masterpieces that she creates. I dream of seeing her works in person, so until then I will devour this book. I am new to her work, but totally amazed by it! I love her style, colors and patterns. I have several books. I am new to her work. Thanks for the introduction and a chance to win. I am fascinaated by her use of neutrals! What a lovely, peaceful selection. I especially like her use of a darker background neutral with the cream appliques. I just completed last year a wedding quilt for my oldest granddaughter that is pieced but mostly applique in different shades of white, creams and taupes. What a challenge! But I can see I could learn so much more from Yoko Saito’s work. I would really love that book! I am definitely an enthusiastic admirer! I could learn so much about color theory from Yoko’s work. I ADORE Yoko Saito, I just wish the fabrics were more available in the UK. How beautiful her work is! I wonder if the book shows how she does the intricate piecing and stitches. Would love to explore her designs. Definately new to the work, I love all that intricate detail! I love quilting and also to look to such wonderful book with awesome quilts …. I originally discovered her unbelievable work on Pinterest. I couldn’t stop pinning quilt after quilt. The muted color pallet is just gorgeous and unique. I want to learn more!! 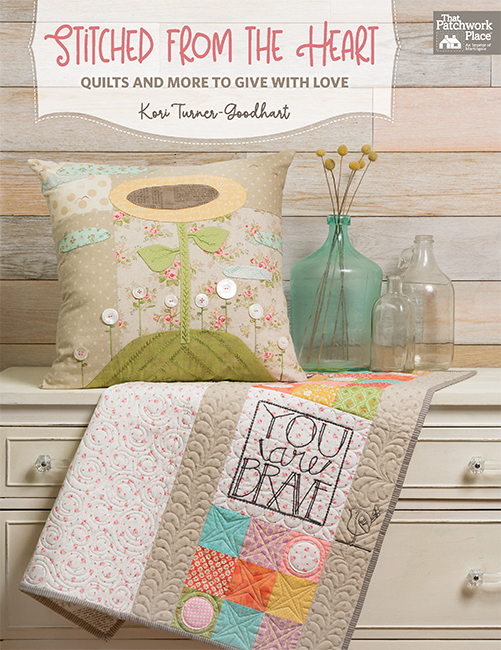 Yoko is an inspiring quilter, her fabrics are soft and tranquil – they touch my soul! Thank you for this generous offer! Love her work. In fact, we started an embroidery group using one of her books. I am an enthusiastic admirer of Yoko Saito and her work. I have watched her doing her straight stitching and with such speed. It is unbelievable! If I could hand stitch that fast, there would be nothing stopping me. Huge fan of Ms Saito’s work – her subtle use of color and the quality of her work — just amazing! I am new to her work, and can only dream of doing such fine needlework! I am truly an enthusiastic admirer of Yoko Saito! I am a definite Fanatical Fan. It is always amazing to see small (and tiny) pieces of fabric evolving into her amazing patterns and designs. I have a lot of her books and just love looking at them. I would love to visit the Houston Quilt Festival one day. I am a fanatical fan who would love to try one of her designs but am very intimidated by them. I love Yoko Saito’s work. I have several of her books and was lucky enough to attend a class with her at Houston last year. This book will be an absolute treat for the eye! I have admired her work for some time and always thought that I couldn’t do that…….. I am getting closer to trying it but it is still intimidating. Wish me luck! I’ve admired her work and would like to try her techniques, but am having trouble finding fabrics that seem to be similar to what she uses. I’m new to her work, but WOW! So pretty. I’m an enthusiastic admirer. Thanks for the info on the book. I absolutely love her work and find just looking through her beautiful books serves as a mental respite from hectic days. I am new to her work–have seen some of her published projects in magazines. Her work is amazing! Just as amazing is this beautiful book and fabric. What a fantastic giveaway, would be very luck to be the winner! Fan! Such incredibly fine handwork and delightful scenes. I am recently new to the work of Yoko Saito. Her work is stunning as is her colour palette! I watched a video in which demonstrated how to applique fine vines…loved it! Love Love the Taupes she uses, The tiny & quick stitches uses inspire me always. I WILL make a Taupe quilt this next year after I get my eyes operated on so I can see to stitch again. I’m an enthusiastic admirer of Yoko Saito. Her workmanship is unbelievable! I am fairly new to her work but absolutely love it. New to her work. Amazing! Amazed at what she produces especially her use of color. Relatively new to her work. I am an enthusiastic admirer. Her works inspire me and make me want to do beautiful projects like her. I’ve always admired Yoko Saito’s work, but I’ve never made any of her patterns … yet! Thank you for the giveaway! New to her work – and it is beautiful! I’m definitely an enthusiastic supporter. Only Yoko Saito can make brown pretty. I have been admirer for years. Have her books and would love to have this one. I’m definitely a fanatical fan. An admirer but afraid to begin to try and copy .. but think with her book I will learn so much. I am new to her work and find it so inspiring. The detail and color pallet in every piece is amazing. Would love to win this! Beautiful book and tribute to a real artist. I am a new fan! Awesome fiber art! I’m an enthusiastic admirer of her work, and aspired to be half as creative as she is. 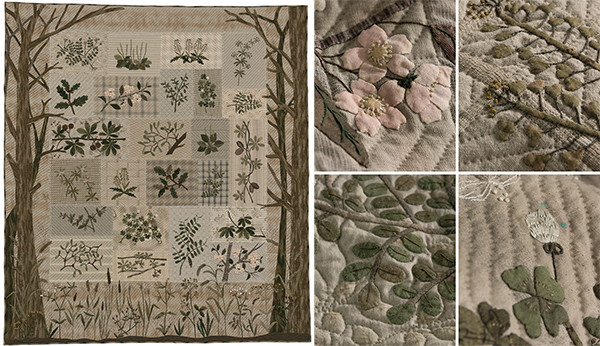 I love her use of neutral fabrics to create the most stunning quilts and accessories I have ever seen. Thank you. New to her work which is absolutely beautiful. I am new to her work and am so grateful to have been introduced to her! I absolutely love her style! I really enjoy Yoko’s work and I very much admire her colour choices. Her pieces are amazingly beautiful. I first saw her work at the exhibit in Houston at the Quilt Festival. Breath taking! All the Japanese quilts and quilt art I have seen have enchanted and fascinated me to no end. It would be delight to have a copy of this book to dream over and be inspired. Thank you. Enthusiastic admirer! I have only recently discovered her work, which I think is absolutely beautiful and amazingly detailed. New to Yoko’s work and am simply amazed! I am new to her work. She is awesome! I do feel lucky every day! I have a great family, good friends, a home, my quilting and life! I am an enthusiastic admirer. Her use of color fascinates me. It is so masterful. She owns it! I am new to her work, which is beautiful! I am an enthusiastic admirer. Her designs and choice of color always catch my eye. I love her work! I love her intricate work and would love to own this retrospective and fabric so I can try her techniques. I’m an enthusiastic admirer of Yoko’s work. 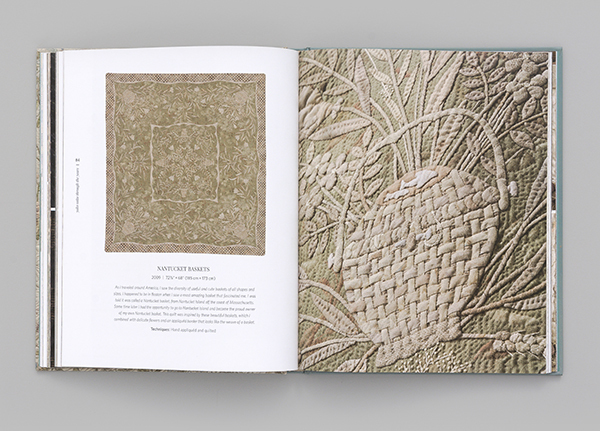 I’m excited to see this book, with the close-ups of the details in her quilts and bags — exquisite handwork! I am very new to her creative, beautiful, and intricate designs. I marvel at the tiny stitches and gorgeous fabrics, truly inspiring! Definitely brand new. I recently saw a very intriguing BOM called 3955 Pieces on another site. Beautiful quilt. Thanks! Having lived in Japan for several years, I am so in love with Yoko Saito and have bought several of her books. I love to do embroidery and quilting and she is certainly an inspiration in those fields. We have a wonderful fabric store here in New Hampshire that carries lots of Japanese taupes. Aren’t I lucky?!! I’ve been an enthusiastic admirer for a long time and would love to have closeup photos of her work and read about her quilting journey. I am new to her work. It is awe inspiring. Absolutely beautiful! I just love her work! I am fairly new to her work, about a year. This is a marvelous give away that I would love to win. I have seen her patterns recreated by friends but have never tried one. She is very talented! Love her work. I especially love her muted palette. I have looked from afar for a number of years at this amazing artist’s work. She is an international treasure. If I don’t win (ha,ha) I am putting this book on my "Christmas list" to buy for myself someday soon. A true artist. I could spend hours drooling over these pages! Enthusiastic admirer! The subtle colors are so appealing. Have many od her books. Love her work. Her work gives a calming feeling. When up tight, I reach for one of Yoko’s books. Then the day is good again. I am a new quilter, so I an not familiar with her work. Only know of her name because of your newsletter. I am not familiar with most quilters work. I always find your newsletter to be informative and inspiring. Thanks for the giveaway. What a treasure to have!!! I love her work! It is truly beautiful. She is a master at embroidery! I would be honored to have her book on my coffee table! What a beautiful book to view and review. I am new to Yoko’s work, it is beautiful! Her work has always spoken to me. I have many of her books and patterns. I’ve admired her work for years. The soft hues and details are amazing and calmingly beautiful. What a great prize for a drawing. Please enter me. Thanks. Love her book and love her fabric. I am in awe of her work. To only be half as good would be wonderful. I had never seen her work – it’s beautiful! I have one of her books. It is absolutely lovely with all the detail in the stitching and design. I hope I have the luck to win this treasure. I’m traveling in Ireland 🇮🇪 right now so maybe I’ll have the luck of the Irish ☘️ on my side. I am an enthusiastic admirer. Fanatical fan!!! I have many of her books – the English translation ones. Her work is soooo exquisite. The close up photos just take your breath away! Thanks for the opportunity to win these lovely gifts. I will be getting the book — one way or another! I am new to her work. It is gorgeous!!! I am mesmerized by Yoko Saito’s quilts and other pieces-they are definitely works of art. I discovered her by accident and have been hooked ever since. I saw her quilts in person and her as well!-at the Houston Quilt Show. The quilts are so beautiful and unique. Oh to be half as talented and artistic as her…. New to her work, but I find it lovely. Thanks. I was a fan from my first glimpse of her marvelous work. I am an entusiastic admirer of Yoko Saito’s work. So beautiful! This artists work is absolutely amazing and I have been a fan for many years…making neutrals a choice in my own quilts! What an incredible book! Enthusiastic admirer! Absolutely stunning fabric artistry!!! New, but completely amazed by her talent. I’d love to win this absolutely beautiful book. New, but completely amazed by her talents. I’d love to win this beautiful book. I love her work. And her books. This new book will be mine, too. Its so Beautiful! I am new to her work. So beautiful! I’m a newbie to her work and love, love, love it. I love her choise of muted colors and he beautiful sewing work. It would take me years and years to be able to be as artistic as she is! Would love to own all of her books. Definitely new to her work. How have I missed her?? Her work is absolutely gorgeous! Have always admired her work! I have one of her books, but haven’t made anything from it yet. New to her work. I have one of her books but haven’t made anything from it yet. I am fairly new to her work. I’m new to her work and all I can say is "WOW!" I will add this new book to my Martingdale book collection. I am delighted to see a coffee table book featuring this great artist . I have several of Yoko Saito’s books. I love the basket book, can’t wait to try one of those patterns when I retire. Love the subtle colors she uses. Would be very happy to win her new book and fabric collection. Oh, my!! Yoko Saito’s work is stunning. There are no words good enough to describe it. I would Love to win this. Luck to us all, especially me. I’m new to her work, very impressed for sure. Her work is beautiful. The book would look great on my coffee table. I love her work, especially her subtle use of color. I admire herbtalent, i have 4 of her books already… Th s would d be a wonderful bonus. I love her work and the photography really brings out the small details. She is so talented – something to aspire to. I am amazed at her work! I’m an enthsiastic admirer. Thanks for the giveaway! I am new to her work and in awe of her amazing skill, would love to own such a beautiful book. I wish I were a fraction as good as Yoko Saito. Her work is so beautiful and complex but yet simple. I love everything she does. I am a very enthusiastic admirer! This woman is seriously talented!! What I wouldn’t give to have the talent she carries in one finger! Beautiful work! I wish I were a fraction as good as Yoko Saito. Her work is so beautiful and complex but yet simple. I love everything she does. It would be my pleasure to be able to enjoy her work anytime I wanted by looking at her beautiful book. A new admirer!! Hope to meet her in Houston. I am a fairly new quilt but love her work. I am constantly amazed by her talent and creativity. Enthusiastic admirer. Just in awe of her work. Enthusiastic admirer. Beautiful book and fabric. I am fairly new to her work, just love it . I’m new to her work but I already love it! What an amazing talent Yoko is! I’m a fanatical fan for sure! This would be a super win! Thanks for the chance! Have admired her work for a long time — beautiful book. I’ll never forget the first time I saw on of Yoko’s quilts hanging at the Houston Quilt Festival. I must have stood staring for at least 30 minutes at all of the fine detail in her involved quilts. I instantly became a lover of Japanese fabrics and all of her patterns. I am feeling lucky! Please pick me! I’m an admirer of her beautiful designs and subtle palette. What beautiful work. Love to win her book to drool over. I learned of Yoko’s work less than a year ago and I instantly became a fan! Gorgeous! I’m new to her work! 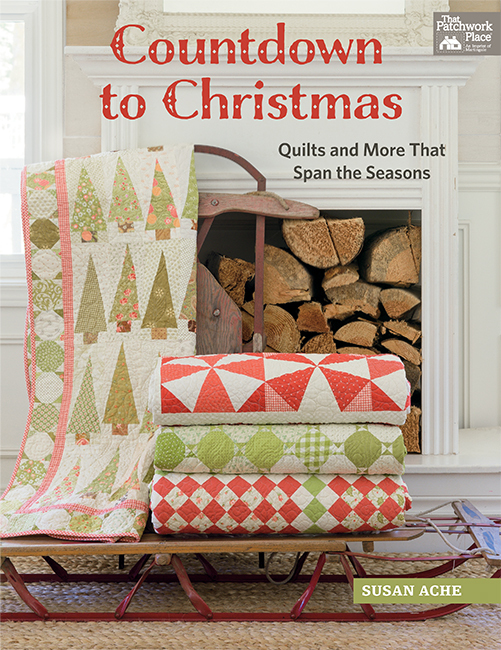 I would love to win the book and fabric to learn more about her quilts! I admire her tremendous skill in choosing such subtle colorways and her patience in working such intricate designs. I hope that someday I have a fraction of her skill. I had not seen Yoko Saito’s work until recently and watched a video demonstration on her stitching technique. Her works are truely unique and her patience must be tremendous as she works each stitch. I would love the chance to win her books and the fabrics. My mum would also enjoy the chance to see these projects as she does ribbon embroidery. I am new to the work of Yoko Saito. Wouw, I like Yoko’s work. I love it. I can dream about it. And I shout be so happy to read it. I hope to by lucky and win. Oh I hope so….. I recently discovered her work and I am inspired by her mastery of her art. I would be thrilled to own this book or her fabrics. Thank you for the opportunity. Amazing! I am new to Yoko’s work. Always been an enthusiastic admirer and love Ms. Saito’s patterns and style! Thank you for the opportunity for this wonderful give-away! I’m an enthusiastic admirer who has a couple of her books, and gets fanatical when I see her work in person! I’m an enthusiastic admirer and am truly inspired by her work. Her work is simply amazing~one-of-a-kind~awesomeness!!! Thank you for the opportunity to win this gorgeous book! Enthusiastic admirer. I have many of her books, but have not attempted to make any of the projects, but I think they are lovely to look at! Yoko’s work is in a category of her own. Her creativity is beyond beauty and measure. I would love to add this book to my collection . Thank you for the opportunity to win! 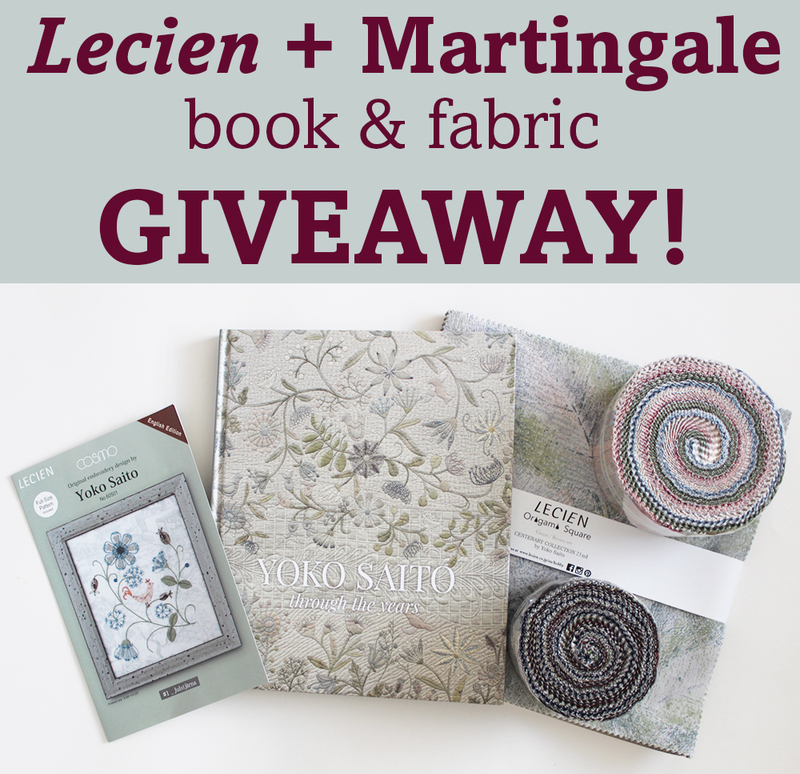 I would be so lucky to win this book and fabric giveaway. The beautiful work she does is inspiring. Would love to have this book!! It looks fabulous and I love her work. I am new admirer of this artist! Blows my mind with every little detail. Thanks for the chance to win a copy! New to her work, gorgeous. I have always had a bit of the ☘️ luck when it comes to textiles. Even like coming across your promotion today. I luckily last month was able to get a collection of fabric types that Yoko uses in her designs every inexpensive, but didn’t know what I would do with them right away. Now maybe today is another lucky day. I would be lucky to have such talent! Yoko Saito’s beautiful work is a wonderful source of inspiration! Every time I see her stitching and designs it takes my breath away. Thank you for bringing her to us. Wow! She is so incredible, I am an admirer of her work and saw a few videos of her doing her magic. I would be over the moon to win her beautiful book and fabric. Thanks. There is a peace in her work, I look at it and find that I relax and enjoy her lines. It has been fun collecting some of her ideas. I would love to win the book, and move forward trying her patterns. Perhaps the actual making will be my way of leaving a mark on the world. Fanatical fan! I have several books and fabric! I love Yokos work! I’d say I’m an enthusiastic admirer! I love Yoko’s work. Her skill in working with such subtle colors and her patience to do such intricate work is amazing. If I ever reach a point where I have a fraction of her skill, I’ll be happy. I am familiar with her work but don’t own any of her books. Her work is amazing! Yoko’s work is very inspiring. It is a joy to observe all the details in her work and be influenced to do likewise. Yoko Saito’s is a "Master" at her craft. She explores the craft whilst sharing with other quilters in the world how to look at fabric, how to look at subtle colour changes, how to be detail oriented, and then shows us how to handquilt playfully. I would be honoured to be considered. Yoko’s work is incredible — have been a fan for a long time! I love all Yoko Saito’s books and the beautiful work that she does. I think I’m both a fanatical fan and an enthusiastic admirer. I adore Yoko Saito artistic abilities. I dream of trying one of her projects in the near future. Would be proud and happy to have this book on my coffee table. New to her fabulous work. WOW!! I love Yoko’s work. Her talent is breathtaking. I own several of her books. They are so inspirational. The pictures show enough detail that you don’t have to be able to read Japanese (which I can’t). I have successfully completed a few of her purse patterns. I love the details. I am an enthusiastic admirer of Ms. Saito. Her work and her originality are amazing. Thank you for producing this masterpiece. New to admiring her work; she has a wonderful eye for color combination. Thanks for the opportunity to win her beautiful book. I am new to Yoko Saito’s work. I have seen a lot of it lately and love it! I love her work and would be ecstatic to win this prize!! I am definitely an enthusiastic admirer. I have several of her project books but have yet to begin my own project. I think the visual feast described in this picture book sounds brilliant. I first found her books on a trip to Thailand, in Japanese, of course. Then I started tracking them down in English. Whatever the language, they are beauty-full, with inspiration and a sense of fun! This book would be most welcome during the dreary days of a winter that seems to be coming quickly. Her work is an inspiration! Oh, to achieve such precision. I’m a long time admirer of Yokos work. Exquisite work and I’d love to win! I’m a Yoko Saito enthusiastc admirer!!! I am an enthusiastic admirer of her wonderful work. She is an inspiration! I’m an enthusiast admirer of Yoko Saito. Love the way she puts fabric together. The artistry of her work is truly amazing. I would love to have her book for inspiration! I am new to her work and it is beautiful! I’m new to her work and it looks fascinating! Would love to win! I didn’t know about Yoko Saito – thanks for the introduction! I saw Yoko’s "Mystery Quilt" quilt at a local quilt show earlier this year. I loved it immediately. Her quilts are very creative and inspiring. Thanks for publishing her book and having the drawing. I love her work, am totally amazed by her detail and thoughtful choices, and am an enthusiastic admirer. Thanks so much for this chance! I think I missed the chance to enter, but I am new to Yoko’s work but now I’m obsessed! Thanks for sharing! Incredible artist! My book is on order, I keep checking the mail daily! I love her work so much, I can’t wait for each book she publishes! This book will be so wonderful to have, I really hope I win! Thanks for the giveaway and for publishing such an fantastic author! I’m new to her work, but I just love it! I feel her sense of strength and calmness, peace and imagination pouring forth from each project she does. What a great inspiration. Thanks for the wonderful give away! I am new to her work, but her attention to detail is breath-taking. fanatical fan! Love her work = incredible. Yes I am feeling very lucky! I can hardly wait to hear I’ve won such a fabulous, generous gift. I am feeling very lucky and can hardly wait to hear that I have won this fabulous give away. I love Yoko Saitos creativity! I love her exquisite work!! I am new to Yoko’s work, but it is stunning. I have been a long time admirer of her work. I usually work in really bright, playful colors, so also find her taupes exciting and sooo calm and beautiful. I have no idea how she gets so many things done! She must have a needle in her hand every waking moment! fanatical fan! Love her work, books and patterns! I have always loved her beautiful work. It is so peaceful and calming. These projects are so cool, soft and elegant! Thanks for the opportunity to win the book and try my hand at making them. I have seen only a little of her work. She is an amazing artist! All of these ladies have wonderful books out, it would definitely be hard to select just one! Adore mini quilts, after making so many large quilts have just loved the minis’! The colors in Ms.Saito’s work are fantastic, so soothing and detail oriented!! Love her work!